Over the last 30 years, one thing in the world of skateboarding has remained constant, and that is the level of innovation Santa Cruz Skateboards have brought to the skateboard community. They have never stopped trying to innovate and stay ahead of the competition and being on the cutting edge of the sport, which is why they remain a leading brand even today. 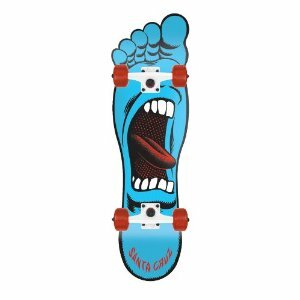 This is a tradition that they are continuing today with the very unique and unorthodox design of the Santa Cruz Skate Screaming Foot Skateboard. The first thing you are going to notice about the Santa Cruz Screaming Foot Skateboard is the fact that it is shaped like a giant foot. This is not your typical skateboard, as you can tell. It seems very odd and unintuitive to make a skateboard in such an unusual shape, and it is hard to imagine that it could possibly ride and handle like a regular skateboard, but it does. This is a very long board, measuring 32 inches long. So don’t expect to be doing all sorts of crazy tricks on this bad boy. However, for cruising around town or campus, the Santa Cruz Screaming Foot Skateboard is ideal. The Bullet trucks are top notch, and easily adjustable to suit your personal riding preference and the bearings are smooth and give you a super fast ride. Santa Cruz Skateboards really went all out on the hardware on this one. The 60mm wheels are large, but not too large, which while it might make navigating rough terrain more difficult than on other cruisers that Santa Cruise Skateboards makes, still provides you with a nice ride. The focus with the Santa Cruz Screaming Foot is speed and to make sure you stand out from the crowd, which you definitely will riding around on a giant foot. The graphics are also top notch on this board. The incredibly detailed graphics are almost nice enough to make you consider not even riding it at all, just putting it up on display and then purchasing one of the other offerings from Santa Cruz Skateboards to actually ride around on. Because of the odd shape, it will take you some time to adjust to riding the Santa Cruz Screaming Foot Skateboard, but once you do it will function and feel just like a regular deck. That said, this might not be the best choice for complete novices, as eye catching as it is. Santa Cruz Skateboards has created a very unique skateboard with the Santa Cruz Screaming Foot Skateboard. If your primary mission is to draw attention to yourself when you are riding, then this skateboard is the one to do it. Currently priced at $124.95 this isn’t the cheapest board on the market however it is in line with the price of other Santa Cruz boards. Word is that this is a limited edition board so it is recommended to buy it early to avoid missing out. This entry was posted in Reviews, Santa Cruz, Skateboarding, Skateboards and tagged Santa Cruz, Screaming Foot, Skateboard. Bookmark the permalink.